MakerDAO and MKR has been the fascination of the cryptocurrency world for the past 12 months. Deservedly so, as almost 2% of all Ether is currently locked up in MakerDAO, DAI is the only permissionless stablecoin, and MKR is one of the few tokens that is required by it’s system, and the system itself is up and running. This article goes into the secondary market valuation of MKR, and the interesting game-theoretical outcomes that result of the Buyback and Burn model. All CDP holders accrue interest on their outstanding DAI loans they have taken out. This Stability Fee has varied from 0.5%, to 2.5%, back to 0.5%, and now all the way up to 11.5%. This fee changes as a result of MKR holders voting to increase, or decrease the cost of spending; a mechanism that balances DAI supply with DAI demand, as well as a way to mitigate systemic risk. This accrued fee goes to purchasing MKR off the secondary market, and burning it. This mechanism ensure propers alignment incentive between MKR token holders, and the governance over MakerDAO. Good governance decisions = more MKR burned over time. Bad governance decisions = less MKR burned over time. [DAI Market Cap] x [Stability Fee] x [Time] = DAI-denominated MKR burn rate. I.e., how much USD-worth of MKR will be burned, per unit-time. This equation tells us how much cash flow the MakerDAO system takes in via MKR burning. As of 19 Feb 2019, DAI Market Cap is 80.5M. The Stability Fee is 1%. 1% of the DAI market cap is accrued per year, or $805,000 in fees generated per year. This means that the MakerDAO system collects $805,000 in interest payments, which is automatically used to purchase MKR, and burn it. As of 17 April 2019, DAI Market Cap is 90M. The Stability Fee is 11.5%. 11.5% of the DAI market cap is accrued per year, or $10,350,000 in fees generated per year. 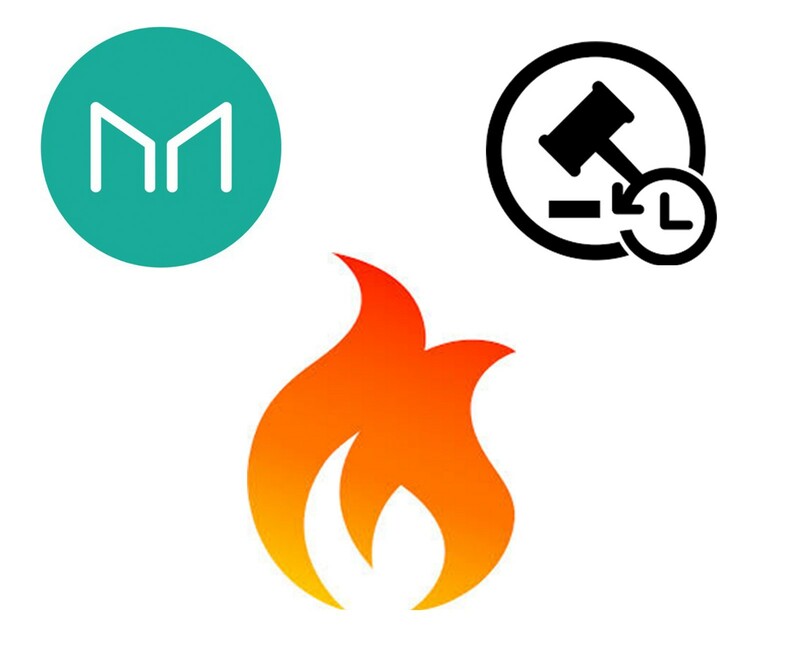 This means that the MakerDAO system collects $10,350,000 in interest payments, which is automatically used to purchase MKR off the secondary market, and burn it. However, this is not Burn Rate. Burn Rate must take into account the USD-denominated price of MKR. If MKR were 100$, then 8050 MKR would be burned per year. If MKR were $1,000, then 805 MKR would be burned per year. If $100,000, then only 8.05 MKR. [[DAI Market Cap] x [Stability fee] x [Time]] / [MKR price in DAI] = MKR Burn rate. i.e. How much MKR will be burned, per unit-time. When CDP holders repay their loan, and receive their collateral, they don’t care what the price of MKR is, because their fee is DAI-denominated. They don’t care if their $35 fee is equal to 10 MKR, 1 MKR, or 0.0001 MKR. They just burn whatever $35 of MKR is. This is actually a quite nice user-experience, as this process can be abstracted away from the user. In order to source the MKR on the behalf of CDP holders repaying their debt, the MakerDAO system takes the stability fee out of the DAI being repaid, and purchases MKR with it on a decentralized exchange (this process entirely automated by a smart contract). Like the user, the smart contract is agnostic to the price of MKR, it just needs to source the USD value of MKR that is owed from the stability fee. If a CDP owner owes $35, the MakerDAO smart contracts puts $35 up for auction, and burns whatever MKR it gets for $35. This happens perpetually, continuously, and autonomously. Anytime a CDP holder pays down their loan, DAI is allocated to be auctioned to pay the stability fee. As a result, the MKR auction is a constant buying force for MKR, as there is a perpetual, autonomous buyer of MKR, so long as the MakerDAO system is in use. Every day, MKR is purchased, and burned, by the autonomous MakerDAO system. The $10,350,000 yearly fees currently being taken by MakerDAO translates to $28,365 daily fees being accrued. An extremely rough calculation estimates this to be about 10% of the daily volume of MKR found today. This amount is perpetual, unceasing, and relentless. AND, it BURNS it, meaning that the same MKR will never be able to be bought by the system twice, unlike what happens with traders trading back and forth. This creates an entirely different valuation mechanism, which we discuss now. What Happens When You Mix a Perpetual Auction with a Decreasing Supply? The weakest hands in the market get their MKR purchased by the Perpetual Auction. On the secondary market, those that value their MKR the least are the ones that get their MKR purchased by the Perpetual Auction. The Perpetual Auction buys out all the weak hands first. While MKR will trade back and forth, back and forth on the secondary market, the auction is always extracting MKR from those that will sell it for the lowest price. The Perpetual Auction is a Weak-Hand Cleanser. By never allowing the MKR purchased by the Perpetual Auction to remain on the secondary market, the Perpetual Auction is a one-way street from Weak-Hands to the MKR-incinerator. But Weak-Hands are on a spectrum. Some people may see $1,000 MKR, and elect to cash-out. Others may see $10,000 MKR and hold steady. But what happens when the Perpetual Auction buys EVERYone, except for the single most strong-willed MKR holder…. …that person has unhindered access to the MKR auction. No other person is able to sell MKR to the Perpetual Auction, as no other person has MKR. Therefore, no one is able to undercut the auction offer. Remember, the Perpetual Auction MUST purchase MKR at whatever the market price is. If there is only one MKR holder, that MKR holder can determine how to price MKR on their terms. This means the last holder of MKR can sell 0.000000000000000001 MKR for the entire value of the auction (MKR has 18 decimals). If 35 DAI is being auctioned off for the 1/10^17, thats an MKR valuation of 1 MKR = 3.5x1^18, or $35,000,000,000,000,000. That’s an insanely large number. The point: The incentive to be the last holder of MKR is INSANELY high. So high, that there will likely never be just one holder of MKR. The incentive to be the last holder of MKR will incentivize hoarding and secondary market removal, which will drive price up, as well as slow down the burn rate of MKR (because MKR burn rate is inversely proportional to the value of MKR vs DAI). The other point: The infinitesimally small amounts of MKR being sold for DAI now represents something that is the total opposite of the Buyback and Burn model that MKR is known to be. If you can sell 0.000000000000000001 MKR for $35, its almost like you’re getting $35 for free. 18 decimals is a lot of decimals. An almost-0 amount of MKR is being burned, but the MKR holder is receiving 100% cash flows of all the DAI in the auction. When there is only 1 holder of MKR, MakerDAO is a 100% cashflow valuation model. Over time (…LOTS of time), Maker slowly transitions from a buyback model, to a cash-flow model. As MKR holders become fewer and fewer (because the auction keeps buying people out), the few MKR holders left have the privilege to sell their MKR at increasingly higher prices to the auction. Even if there are very few MKR holders left, however, there is still the same incentive to hold on to your MKR, while you secretly hope everyone else sells their to the burner action. Personally, I think the chances that we actually get to that point is slim, at least in our lifetime. If what I am saying is true, and if people realize this, the game theory described behind not-selling your MKR will be the mechanism that drives MKR valuation up, rather than the actual perpetual buyback and burn mechanic. It’s the existence of the buyback and burn model that will create MKR appreciation, not the actual buybacks themselves. There will always be plenty MKR out there to burn, simply because everyone wants everyone else to sell first. Here we see the unique valuation mechanisms found in crypto-economics. The valuation of MKR will be entirely based on the incentive to not have access to the Perpetual Auction. In order to benefit from the Perpetual Auction, you must own MKR. CDP holders purchase MKR indirectly, to participate in Perpetual Auction, but only to purchase MKR to burn it. If you want access to the Perpetual Auction, and have it work in your favor, you must purchase MKR earlier than everyone else, and then also not sell your MKR before they do, less you receive less value than they would. Who’s gonna be the first to sell their MKR? The value of MKR is something like Double-Compound Interest. For every person that has been bought-out Perpetual Auction, the Stability Fee becomes more impactful, as the fees accrued represent a higher percentage of the MKR supply. This is the role of a stock-buyback. When a company executes a stock-buyback, the future dividends being paid by the company are able to be split amongst a smaller portion of people. But MKR never actually releases a dividend. It ONLY offers stock-buyback. The value that MKR holders receive from holding MKR is having the ability to determine the price at which MakerDAO buys back their MKR. If they wish sell their MKR to the Perpetual Auction for a MKR valuation of $10,000, then thats fine; they will just have to wait for the Perpetual Auction to buy out all those who want to sell their MKR for up to $9,999 first.